Lucy Nabiki Takona was born in April 1991 in a village called Naroosura in Maasai Mara. Her childhood was that of a typical Maasai lady brought up in the Maasai community. She started school at the age of 13 years, her dad had attempted to marry her off to a very old man who she had never met. She was very disappointed because she wanted to complete school since she was the only girl who had gone to school in her village. She was inspired by her female teacher and was dreaming of one day being like her. When she discovered that her dad wanted to marry her off, she ran to her aunt’s to seek refuge as she was supportive of education and all her children were going to school. She then intervened and called a meeting with the elders and with Lucy’s dad and they succeeded in convincing him to take her back to school. It came a time when in school, they went on a school trip to Nairobi National Park where she met a lady who took them around and from her Lucy gained the interest of becoming a safari guide. 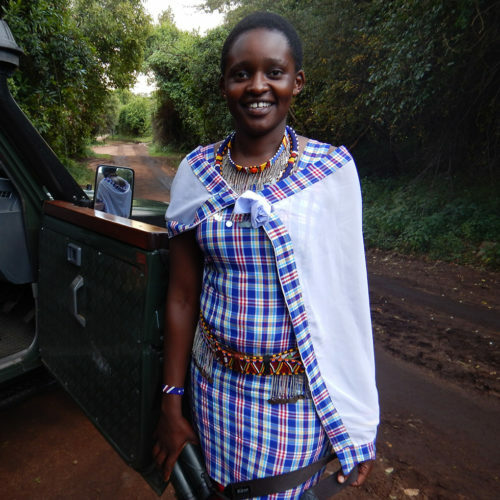 When she finished high school education in 2010, she joined Koiyaki Guiding School in Maasai Mara at Naibosho Conservancy for 2 years where she graduated as a safari guide. Later she joined African Impact Voluntary Project in Naibosho Conservancy that deals with the monitoring of the big cats and community work. She gained 3 years experience in the field by working with them and later moved to Enkewa Camp where she was given an opportunity of being the Safari guide she had always wanted to be. While she was out on game drives, she said she would meet with our Cottars Safari guides and had always admired them and liked to work with Cottars. In the beginning of this 2017 she approached us for a job and we were delighted to have her join our team, Lucy is our first female guide and we are very proud of all the work she’s done.